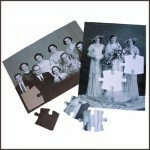 Have your own photograph transformed into a cardstock or ecoboard jigsaw puzzle in the number of pieces you want (16,20,24,30,48 for ecoboard and 16,20,24,30,48,60 for cardstock). Choose the item in this category to add to the shopping cart and we will contact about your photo. All photos must be 500 kb or more in file size.